Just like rice, fish sauce is a staple of almost every dish in Việt Nam. “For Vietnamese people, a meal without fish sauce is considered incomplete,” culture expert Trần Ngọc Thêm once wrote in his book Việt Nam Culture Foundation. A bowl of fish sauce, nước mắm, is placed at the centre of the table so every one can reach it. Some may not eat vegetables, some may not have meat, but everyone has rice and seasons the food with fish sauce. Therefore, how one places the fish sauce bowl can tell a lot about etiquette and consideration for others, according to Thêm. 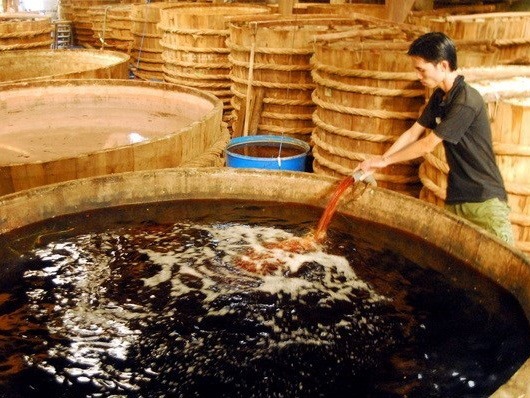 Nowadays fish sauce is popular in Southeast Asian countries – in Thailand it is known as nam pla, in Myanmar as nganpyaarrai, in Korea as eojang. In Việt Nam, fish sauce is used widely – as a seasoning, a dipping sauce, in humble daily meals and at fancy parties. Nước mắm is said to help distinguish Vietnamese food from that of its neighbours. No one knows exactly when Vietnamese people started making and using fish sauce. It was first documented in Đại Việt Sử Ký Toàn Thư or Complete Annals of Đại Việt (Đại Việt is the former name of Việt Nam), a book compiled by royal historian Ngô Sỹ Liên in the 15th century. The book mentions that in the 10th century, locals made fish sauce and offered the condiment as a tribute to kings. This indicates that Vietnamese people used fish sauce before the 10th century and that it was a well-known specialty that Chinese rulers demanded Việt Nam give as payment. Other Vietnamese historical books also recorded nước mắm as a specialty of some central regions of Việt Nam and as a commodity required by the government as a form of tax in some periods of the Nguyễn dynasty (1802-1945). In other words, households that made fish sauce had to pay the government a certain amount of fish sauce every year. American Poet Bruce Weigl who fought in the battlefields of the central province of Quảng Trị in 1967 and 1968 during the Việt Nam War, waxed poetic about Vietnamese fish sauce in his writing My Own Personal Fish Sauce. “In a meal of Vietnamese people, rice is like the quintessence from the earth, fish sauce is the quintessence of water. They symbolise the Water and Earth of the five basic elements of the universe (the others being Fire, Metal and Wood),” wrote Thêm. “Fish sauce is used all over Việt Nam, yet no region can use fish sauce more cleverly than Huế people because in Huế (a former royal capital) culinary culture, there are at least 30 different dipping sauces with the main ingredient being fish sauce, featuring a number of flavours – salty, sweet, sour, spicy, balanced, light, strong. It is simply because Huế people have different dipping sauce for different dishes,” wrote culture researcher Trần Đặng Anh Sơn. There are many ways to classify fish sauce in Việt Nam, according to culture teacher Nguyễn Thị Tuyết Ngân, from HCM City’s University of Social Sciences and Humanities. Besides fish, locals in three regions of Việt Nam also ferment crab, shrimp or squid to extract liquid. The northern province of Thái Bình or central province of Thanh Hóa have long been famous for their mắm cáy (fermented crab sauce). Cáy (sesarmidae), also known as red-chileped crab, is found along rivers. Crab is then ground and added with salt and thính (ground roasted rice). The mix is put in sunlight for a month and the liquid easily seeps down from the crab. Boiled dishes like pork or rau lang (sweet potato’s leave) are paired well with crab sauce. 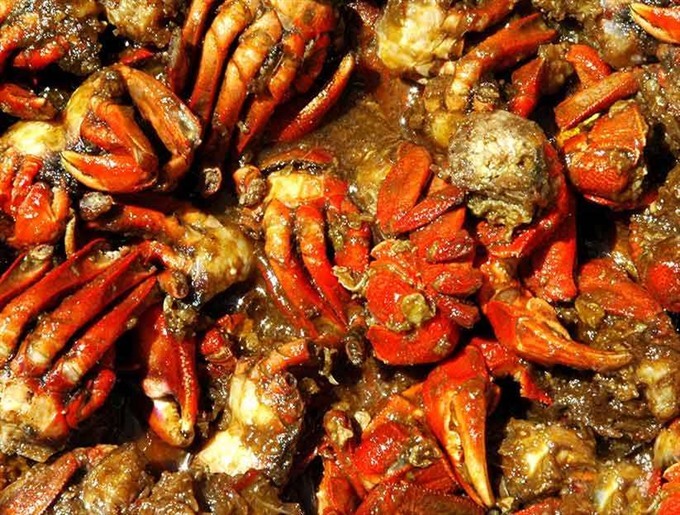 In many regions of Hậu Lộc, Hoằng Hóa, Quảng Xương districts of Thanh Hóa Province, crab sauce is used in exchange for other commodities, like rice. Similarly, in the southernmost province of Cà Mau, locals make fermented ba khía sauce. There is a crab species named ba khía, which appears only a few times in October, when the water rises. It is unique to the south, living in brackish water regions.